There are a lot more deer in the area where I live than there used to be. They are beautiful creatures, and fascinating to watch, but they sure can do some damage to your car when they run out in front of you as you are driving along the highway. My wife and I have each hit two deer with our vehicles in the past 6 years or so. 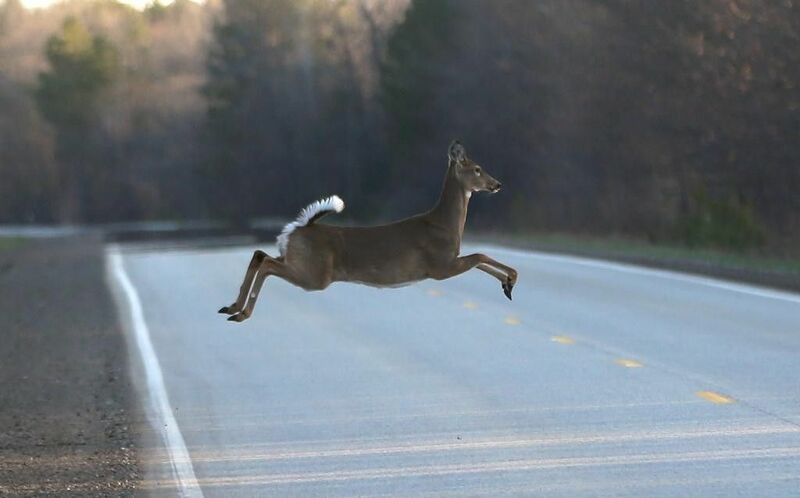 The thing that I notice about deer running across a highway is that it seems that quite often they have made a final decision about their direction. They have chosen a path and they will not deviate from that path for any reason whatsoever. Even if their pre-determined course leads them to their doom, they will stay the course. Some people are like that. They choose to ignore God and head down a path of destruction. Friends and family members may plead with them to reconsider their ways, but they will not do so. They have already made up their mind, and they continue down the path of destruction. That doesn’t mean we should stop trying to save them. After all, occasionally a deer will actually turn around and run to safety. Sometimes people will do that too. “There is a way that appears to be right, but in the end it leads to death.”—Proverbs 14:12. This entry was posted in Christian Living and tagged damnation, deer on the highway, deer running, hit a deer, illustration, Proverbs 14:12, repentance, running from God, salvation. Bookmark the permalink.